This map shows the levels of hardness tends to increase the further south east you go. Most of Devon and Cornwall in the south, North Yorkshire and Cumbria in the north and the western counties of Wales have soft to moderately soft water. Northumberland, Tyne & Wear and Lancashire down through the Midlands tend to have slightly hard to moderately hard water. Lincolnshire, the Home Counties and the south east have hard to to very hard water. 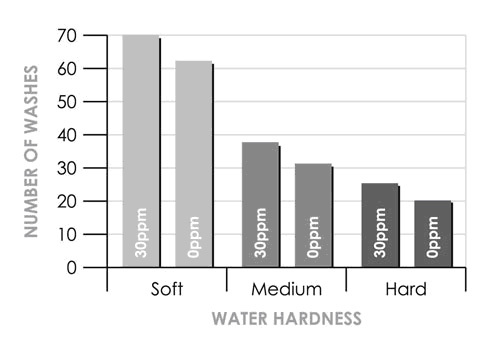 The majority of Scotland has soft to moderately soft levels of hardness, although some areas have levels of varying hardness. Approximately ten litres of purified water should be sufficient to rinse an average four door saloon car. These figures are intended as guidelines only. Factors that reduce filter life include, hard water sources, use from a water softener (due to added salt content) and water from bore holes.